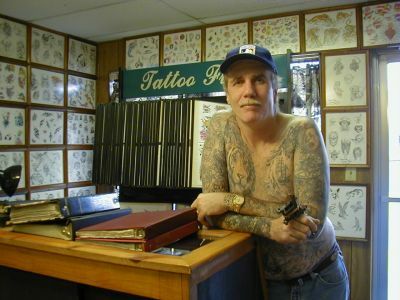 Doc Don Lucas is an international award-winning historian and artist in the field of tattooing. Based in New Orleans, he is: the operator a tattoo studio, the owner of one of the largest collections of tattoo memorabilia in the country, and the author of several books on tattooing. If you have any interest in tattoos, you’re bound to find something of interest on this web page. You can view some recent tattoo photos of Doc’s work; Doc Don’s books are available for sale, as are some historic items of tattoo flash, and some spectacular postcards that really let you feel what the old school of tattooing was like. Visit on-line store. We’re also in the process of putting parts of his vast collection on-line, to share the history and variety of the tattoo world. You can view memorabilia in our Tattoo Louvre. Please browse around and let us know what you think. We’d be happy to answer any question that you might have about Doc Don, Doc Webb, Franklin Paul Rogers or tattooing in general.